If you have a freelance business these days, you know that LinkedIn is the place to be. I for one, am spending more time than ever on LinkedIn, engaging with fellow freelancers, business networks, former colleagues, and existing and potential clients. But let’s face it, we all sometimes struggle to find something interesting to post. So, let me do the work for you! Here’s 21 easy post ideas that you should try out now. Get the conversation started and catch the eye of your target market. You can always find something interesting, deplorable, eye-raising, annoying or hilarious in politics these days. Whether it’s current political antics (and there’s definitely been a lot of that lately), the latest funny from Trump, or the worrying erode of funding for arts or society, drop it in. Contentious issues are a great way to drive conversation, demonstrate your worldly interest in XY and Z, and throw in a bit of your personality. Most of my non-work friends aren’t interested in predicted 2019 Facebook trends or what Kate Toon thinks of Google’s latest SEO algorithm. But I gobble that stuff up. And you’d better believe that loads of my LI friends and work connections would too. So share the content that affect your potential and current clients and peers AND tell them why they want to know about it! It’s a great way to show your expertise and interest in helping others. Articles are a great way to share your expertise and skills in your own field. Throw in a catchy graphic and some links, and away you go. 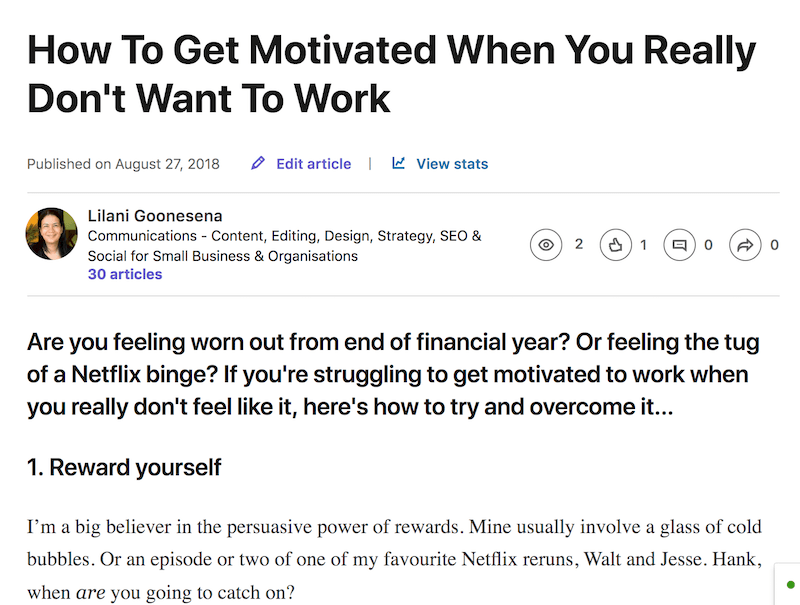 LI articles offer a reliable way to repurpose your existing content - blog posts, articles for other publications (NOT reproduced, of course, hello copyright issues! ), case studies etc. Which means you’re not re-writing anything, just offering it up to a different audience. One added bonus is that not many people bother to do this, so it really gives you an advantage. Try it out and see! Everyone loves a snazzy infographic, especially one that shares useful info as well as looks pretty. The internet is littered with them. One of my favourite sites for infographics and generally interesting articles is Social Media Today. Sharing short snippets of helpful content is always popular on LinkedIn. I write loads of how to blog posts on business, social media, marketing. So, grabbing a blurb from them is a good way to share useful content, increase blog readership, and engage my followers. Selfies are so big right now. And while the last thing you may want to see is a bunch of strangers grinning like goons at a cool event you wish you’d been to, they can serve a useful purpose. You can tag everyone in it, which automatically mutli-raises your engagement stakes, as everyone tagged is likely to respond. It’s also a good way to give a shout out to the event and the hosting company, and to show your external audience that you’re in the industry. Nothing says industry go getter like someone who pays to travel and attend key networking events. By this, I don’t mean be rude or offensive but sharing an opinion, particularly on a trending issue, is a great conversation starter. Yep, the power of video is still strong. Whether it’s a Friday funny or one of those inspiring World Economic Forum clips, video are still viewed and shared more times than any other form of content. Sharing other people’s posts is a great way to make new connections and share important issues. You can take this one step further and share your client, or potential clients’, posts. Just be sure to add a comment that expresses your interest in the topic, and pushes the conversation a bit further. Trust me, they’ll appreciate it. For many, LinkedIn is still first, and foremost, a job site. So, it’s the perfect place to post a new job, share your clients’ job listings, or ruminate on your dream job. Top 10 lists are always a favourite on most forms of social media. In LinkedIn, they work particularly well with books - “10 Top industry Reads about X”, or “Top 10 Summer Reads”. Don’t forget to show off some snazzy covers and tag the authors. If you are your business was highlighted in a news story, blog post, photo, or other social way, then share it on LinkedIn. It’s a great way to draw connections between your business and others, and to legitimise your own business. Testimonials just keep on giving. Take a good one of yours, keeping it short and sweet, and share it with the world. Wrap it in a pretty package - I use Canva for all my graphics - or just quote it in text. Just make sure you have permission from the person giving the testimony to use it on social media. Or if they’re not comfortable doing this, you can just use a first name and the industry. Posing a question around a trending issue or controversial image is a great way to generate comments and engagement on LinkedIn. You can voice your opinion or just leave it neutral, allowing others to weigh in with their 5 cents. Is it just me, or do you stop and drool over food photos? But you don’t have to be a professional photographer, restauranteur or food blogger to share food photos. Snap a pic of your morning pastry and coffee captioned “breakfast on the go”, or of a delicious lunch as a work meeting. No one need know or care whether it’s actually true but since everyone loves to imagine themselves fine dining on the job, why not give them a little eye candy? Give your follower, clients and potential clients some insight into the way you work. It could be before and after shots of a home makeover, a logo in transition, or even your blog writing process. People love seeing processes and it shows organisation and the ability to carry a project through to completion. And don’t worry, if it’s interesting to you, it’ll be interesting to your peers and target audience too. LinkedIn is a great place to share images or links to your recent work projects. For me, I can post screenshots and links to my latest websites. For writers, post links to those fabulous articles. Photographers have no end of material… and well, pretty everyone can post something about what they do, preferably with a great image or two. There’s no one like your industry peeps for appreciating in-house jokes about bad fonts or dodgy clients. Just as other mums love jumping on the mum bandwagon, and women love singing feminist praises. Find your tribe and throw out a meme, cartoon, image or link to an article you can all appreciate. Not literally! Just share a bad but amusing incident with a client. 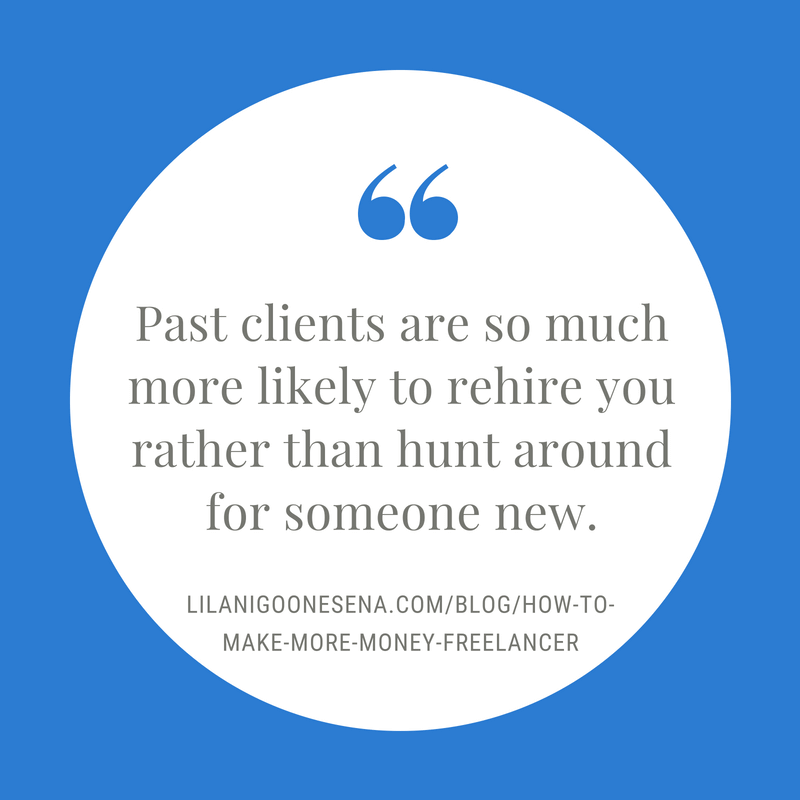 Maybe you waited a year to be paid (hello freelance writing), or they never spelt your name properly, or drove you crazy with last minute additions. And far from showing you up as incompetent, they show your humour, personality and human side. We’ve all got one of those, right? 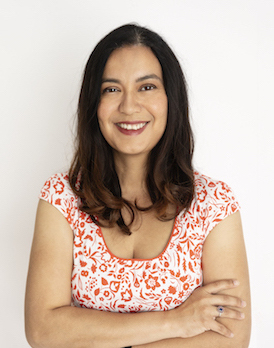 About the author: Lilani Goonesena is a freelance communications specialist for small businesses and organisations, based in Canberra. She works on Squarerspace web design, SEO content and digital marketing strategy. She writes an awesome newsletter on digital marketing, social media, blogging, web design and "all that online stuff".